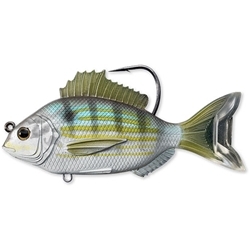 Fish the LIVETARGET Pinfish Swimbait near pilings, rocks, mangroves, docks, grass flats or other structure where fish hide. This swimbait is factory rigged with a heavy-duty hook; be ready to heave big fish out of cover with confidence. Saltwater.